Note what you perceive in this picture … the clothing, make-up, etc. When you meet someone, what do you see? What do you think about? What impacts your thinking? My guess is that you probably get an overall impression, and then you begin to break that impression down. A Rolex might suggest wealth. A backpack might suggest a student. Hair style … glasses … clothes … skin tone … jewelry … shape of the face … weight … height … a smile … a smell … and the list goes on. … All of these are things we process when we first meet someone. As I indicated in a previous post, this is what the famous sociologist, Erving Goffman, refers to as the presentation of self. I recently left my office to make a bathroom run, and happened to pass a colleague, a priest, sitting in the main lobby. We had encountered one another at meetings, but had never really had an opportunity to talk. So, I stopped and said “hello.” After excusing myself briefly to do what I had gotten up to do in the first place, we ended up engaging in a long conversation. He asked me about my thesis for my PhD in sociology. That led us into an in-depth conversation about online community, electronic research methods, and my sociology research and teaching. He was fascinated about my thoughts on online research methodology, my research on online community, and teaching topics for my course on technology & society. Next we talked about my focus in business school, what I studied and why, which led into an interesting conversation about international trade agreements and the economic inter-dependency of nations. To explain how I ended up in business school from the School of Theology, we discussed how I used a research grant to study the religious roots of rebellion, but then discovered I was more interested in economic justice and the relationship between the US and Central American economies. The discussion about how I got to business school led to a conversation about my theological education, studies in liberation theology, and my experience in the Episcopal Church. We talked about ordination, serving in the church, and the various ministries in which I’ve participated over the years … cooking in a soup kitchen, serving as a pastoral intern in a boy’s prison, etc. 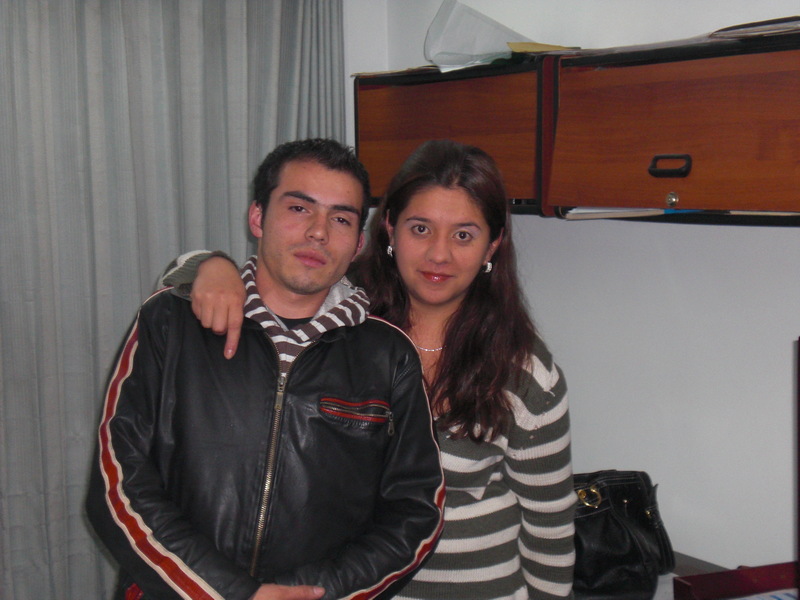 We both talked about our personal lives, our childhoods, our families, and school experiences. We discussed career moves, job experiences, and many other personal things. Our discussion included a call to ordained ministry, the ordination process, and our service in the church. 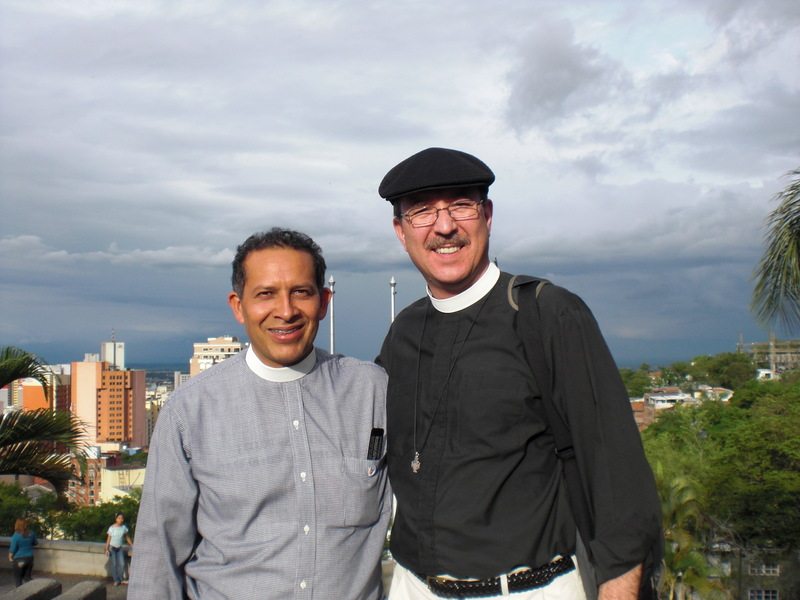 Then he asked, “Why are you in Colombia?” To answer that question, I felt the need to have a longer discussion about more personal details about my call to ordained ministry, mission work for the Diocese of Massachusetts, and some more recent events in my spiritual life. We then talked about how I ended up contacting Bishop Duque, my meeting with him in Miami, and then my arrival in Colombia. 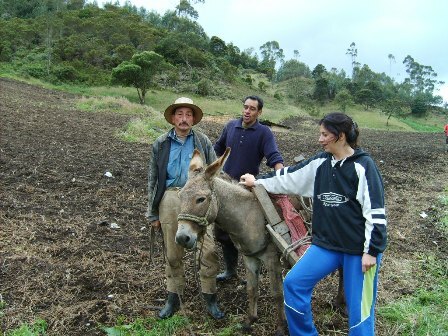 Classic campesino … the farmer wearing the hat. After our lengthy conversation, he said something that struck me as rather odd. He looked at me and said, “I guess we can be friends now.” I was a little surprised, and wasn’t quite sure what he meant. So, I asked, “Why did you say that?” “Does this mean you now have a different perception of me than you did before?” He shook his head affirmatively, so I asked him to explain his initial perceptions. The first word out of his mouth was “gringo,”with a few other descriptives following. Though the use of “gringo” emerged years ago as a name for foreigners who didn’t speak Spanish very well, it has evolved in some regions to reflect a mildly pejorative perspective on foreigners. I was lumped in with all others who come from wealthy nations, and based on the other descriptives, assumed to believe that I think I’m better than Colombians. And whether or not it’s intentional, gringos also have a tendency to act as though all Latin Americans are campesinos … poor, uneducated, country folk … reflecting a kind of gringo arrogance. So, the assumption includes my having a certain North American arrogance. 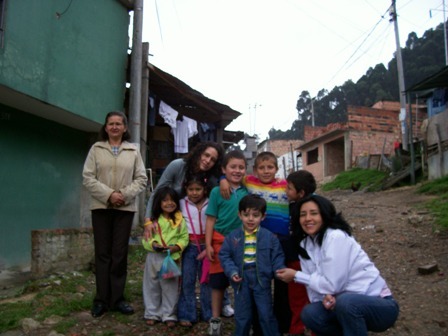 And being a missioner doesn’t automatically soften the assumptions; when Colombians first encountered missionaries, they were among the colonizers with a hegemonic agenda. Having shared our stories, he now thought differently of me. It’s not surprising that someone might have preconceived notions about a certain type of “gringo” and include me among them. It’s only human to make certain assumptions about people based on what we know, or think we know. In addition, Latin American experiences of North Americans has not been very positive. For example, there have been times when the US government has supported business interests even when it was known that the companies being supported were engaged in oppressive, and/or legally questionable, business practices. Adding to that, I have no way of knowing what someone has heard about me or what their experience has been of other North Americans. I don’t know how other North Americans have dressed, what they’ve said, or how they’ve behaved. These, and any number of other things, could be informing someone’s perspective of me before we ever get to know each other (and, of course, that works both ways). Most mission preparation books, at least those that I’ve read, tend to focus on our impressions of other people and cultures, and not the other way around. In one of my favorite mission leadership books, When God’s People Travel Together, different perspectives and perceptions are discussed as an issue of diversity among the members of a mission team, and not about the perceptions of those with whom we may interact in another country. Sometimes in pre-trip meetings leaders talk about things like not wearing t-shirts with offensive pictures or phrases, women not wearing blouses that are too revealing, or men and women not wearing tattered pants when on mission. They do so, because they don’t want their hosts to think they are rude, inconsiderate, disrespectful, and so forth. They also do so, because they know that what we wear and how we behave will leave an impression, both of us as well as of those who come after us. We are all capable of pre-judging someone, and all of us are exposed to the possibility of being pre-judged. As noted in other posts, to be able to do our work missioners need to acculturate and develop a level of comfort in a new environment. In addition, though, we also need to develop relationships and build trust. What we tend to forget is that the people with whom we live and work when engaged in mission, be it in the US, or outside of the US, carry their own experiences and knowledge that informs their impressions of us. They are also as human and broken as we are … not more … not less … just the same. Sometimes mission folk talk about the idea of the “noble savage” as a way of helping others counteract the potential for misguided thinking in our perceptions of others. People who reflect the noble savage way of thinking share a mindset, way of thinking, and patterns of behavior that idealize others … most often people who are impoverished, indigenous, etc. From my perspective, it’s just as offensive to think and behave as if people with whom we interact are somehow “better,” as it is to think of them as “less than.” Both reflect prejudicial thinking. People of all nationalities and races, rich, poor, black, white, red, yellow, etc. … are all just as likely as the next person to be moral or immoral, just or unjust, kind or unkind, rude or polite, considerate or inconsiderate, and so forth. Obviously, I’ll always be a gringo, so to speak. But I don’t want people to think of me as selfish, rich, inconsiderate, or whatever other adjective they might want to attribute to North Americans, nor do I want them to think … or believe that I think … that I’m somehow holier than thou, because I’m working as a missionary. I also don’t want anyone to think that I think they think that way. I just want them to get to know me, Ted, in the same way that I want to get to know them. I want us to set aside our preconceived notions and perceptions of the other. I realize that it’s difficult for all of us to let go of our preconceived notions in our daily interactions. But for me, as a Christian, I do my best to try, and then leave whatever I can’t to the work of the Holy Spirit. To put it simply, we holy types tend to romanticize both ourselves and the other. When that does not work out, an easy response is to demonize ourselves, or the other. You put it much more professionally, with wise advice. That was in response to the teacher’s leading question, “Would you do it again, would you encourage others to do something similar, and why?” My response was, simply, “In a heartbeat.” And, yes, I got away with the addendum in a public school. Grateful to know you, kindred soul… Thank you, as always, for sharing your “perceptions” and your heart!